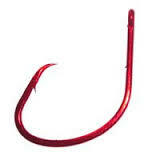 Do you use circle hooks for catfish? Here, Tim “Doc” Lange makes some suggestions for successful catfish fishing with circle hooks. How many times have you been waiting for that telltale jerk that a catfish sends you to tell you, yes I’m here. Then you just sit there and wait and nothing happens then guess who’s the jerk now? Well I got tired of feeling like the jerk on the end of the pole so in 1999 Lynn and I switched to circle hooks. Circle hooks in my opinion have increased our hook-ups on Flatheads tremendously, In fact I swear by them and will not be going back to the regular style hooks anytime soon. I got tired of picking up a rod and swinging and missing fish, circle hooks eliminate that problem. It takes time to learn how to use these things, for a novice it is pure pleasure, small jerk one fish, on the other hand for a seasoned cat man or woman they can drive you crazy. Your first reaction is to grab the rod and sweep it back and all your going to get is air with no resistance from a fighting cat. Patience is the key to success here, you just have to learn not to get in a big hurry. We wait until the rod is loaded up with a pull of a Flathead before we start to even reach for a pole which is so much different than it used to be. Lots of times you missed a cat with normal hooks if you didn’t get on it quick, not so with circle hooks, just kick back and wait till the rod is down and the drag has released under the pressure of the pull. I used to be nervous as a cat when I started using these things because it was a different way than I had been taught. 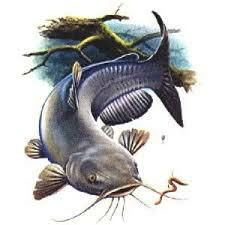 Cutbait is awesome on a circle hook as most cats will grab the bait and turn, the point just digs right into the corner of the mouth and the soft part acts like a shock absorber to a fighting catfish, he just can’t get any ground because it gives as he pulls and it will wear him down. They are a little tough to use on live bait, it gets hard to stick that hook in the back of a shad due to the point being turned in towards the shank, and that is why I like Gamakatsu circles because the point is offset just slightly so that I can thread the hook into the back of a shad. Live bait rigging with circle hooks is much different. I use a three-way rig with about a foot of weight line so my bait is off the river bottom just slightly. I use my clickers on my 6500 but only with live bait, as a Flathead moves off I pickup the rods outs of the rod holder and maintain that constant pressure. Then engage the reel with a turn of the handle and hold on. The rod bows down and the drag breaks free, and the fight is on, big fish just tear off and you hang on. Some people hate circles, some like myself love them it’s all just a personal preference. And my preference is I want to boat every fish that jerks the end of the pole.